Bring a pot of water to a boil over high heat; add potatoes, reduce heat to medium-low and cook potatoes until tender (about 15 minutes). Drain immediately. In a large bowl, mash the drained potatoes; add milk and 4 tablespoons butter to bowl. Stir until combined, set aside. 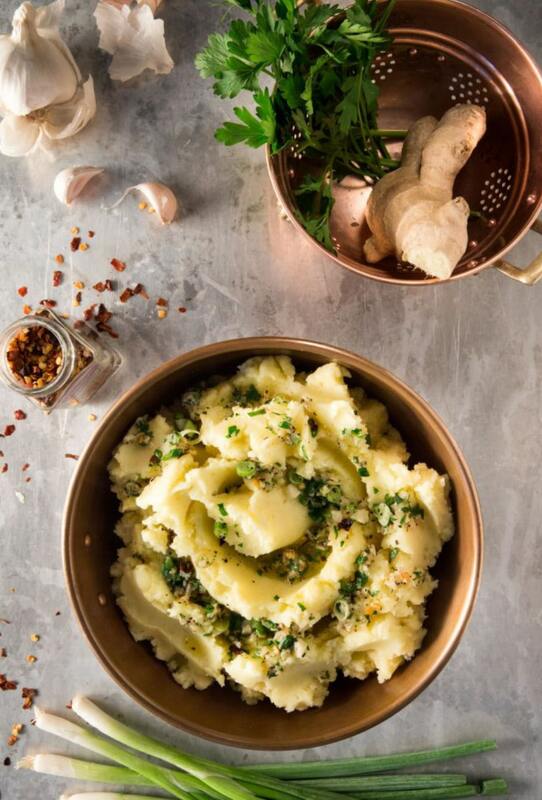 Using a mortar and pestle, mash garlic, ginger and salt to a paste-like consistency. Heat olive oil and 2 tablespoons butter in a small skillet. Add garlic-ginger paste, black pepper and red pepper flakes. Heat over medium-low heat for 1 minute, or until garlic-ginger mixture is soft and fragrant (not browned). Remove from heat; add green onions and parsley. Stir mixture into mashed potatoes. Taste and adjust seasonings. Serve warm.